Would it be called the completion of an optimal office environment if the desks with the latest design, comfortable task chairs, PCs and a network environment are provided? The answer is "NO." It is important to define the design requirements at the starting point to create the office which brings out the maximum performances of workers. 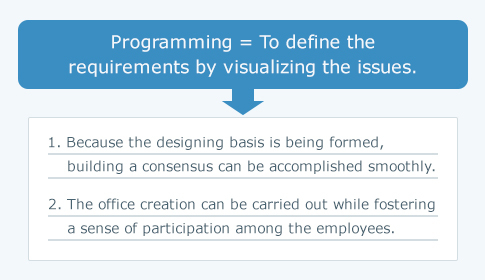 The process of defining the design requirements by visualizing the issues to be resolved and linking them to the following plan is called "programming," which is derived from the meaning of the English word "program" (plan, schedule). Programming is the important starting point which decides the future of the office creation. 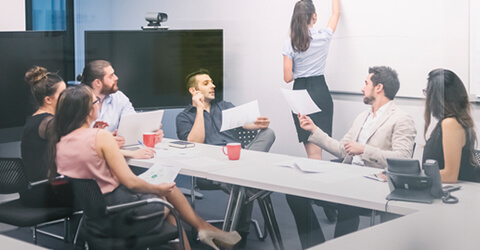 Develop a deeper understanding of the organizational vision and issue recognition by confirming the requirements identified from a management viewpoint for the new office and formulate a project goal and concept. 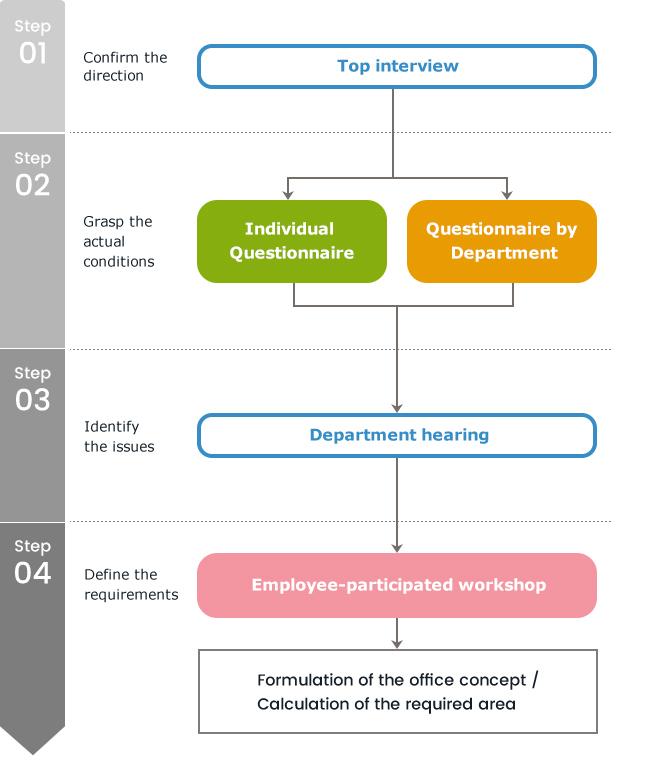 Clarify the issues lying in the office space and the structure to support the business activities identified by the department leaders with a management viewpoint and the individual workers with an on-site viewpoint. Conduct a questionnaire survey by department. Grasp the actual frequency of the meetings, visitors and events, and then calculate the required number and capacity of the meeting spaces and conference rooms. 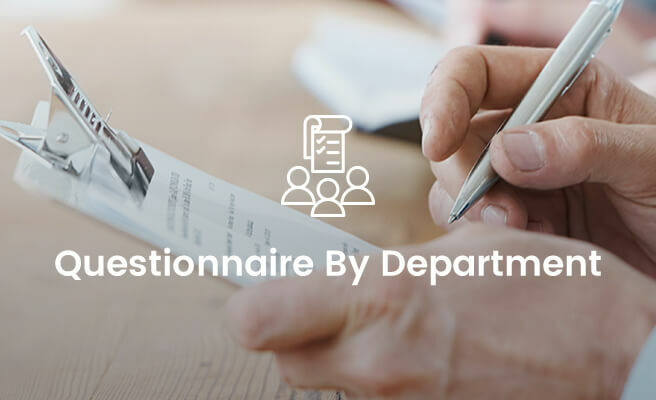 Conduct a worker survey to quantitatively grasp the current volume of the documents. Utilize the survey results, after being analyzed by a consultant with filing system leadership experience, to review the cut-down ratio and document management structure. Conduct a questionnaire survey by department. Clarify the correlation in the business-related communication among the departments as the basic information for the communication plan. 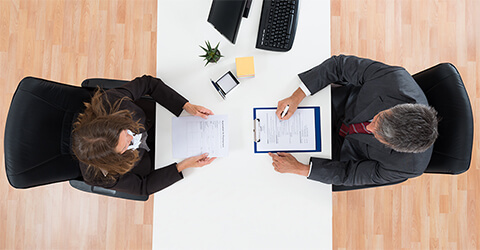 Conduct an individual worker survey. Grasp the work characteristics of the office workers through the composition ratio by work location/work breakdown and then clarify the worker's behavioral pattern by department and type of work. 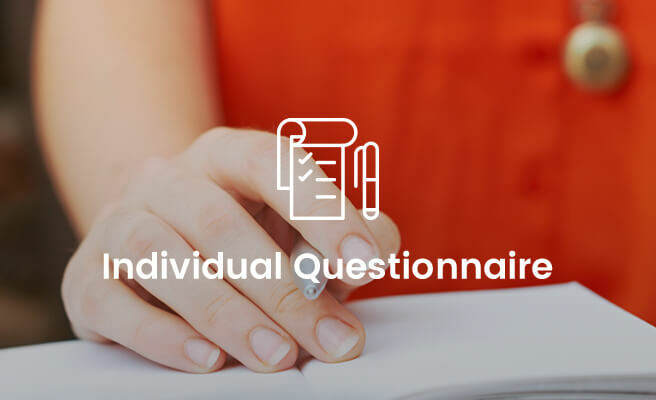 Conduct an individual worker survey. Identify the priority of the issues lying in the current office and clarify the most effective order of the issues to be resolved. Improve the management method by identifying the issues of the documents occupying a wide area through examining not only the "volume" of the documents, but also the "quality (work efficiency/information management)" such as the document management method and/or current referencing conditions of the documents. 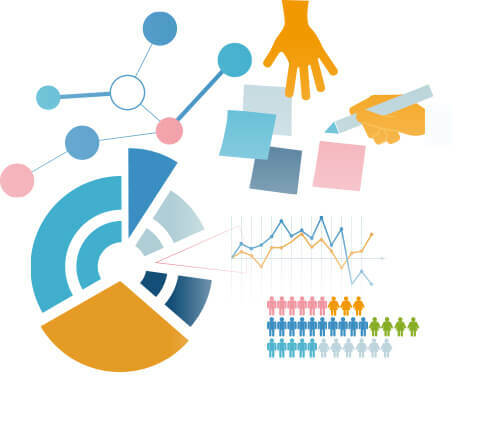 Search for the best practices to resolve the issues identified in the project through examining the latest examples of the other companies and/or the results of the research and investigation being conducted by various institutions, while considering the social conditions surrounding the businesses. Expand the images of the space and activity scenes necessary to realize an ideal office environment. 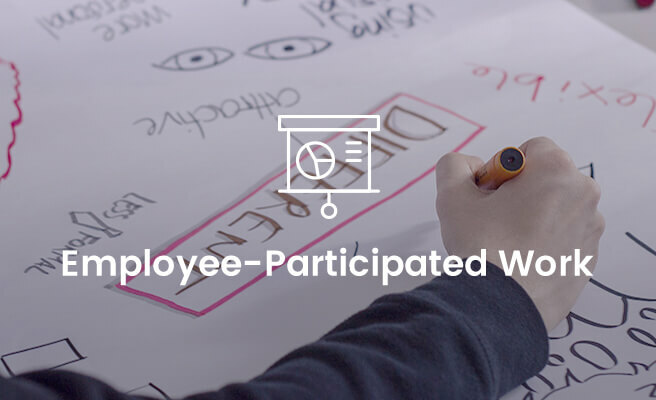 Support the participants to actively generate the new ideas by using the tools which make the discussions active.